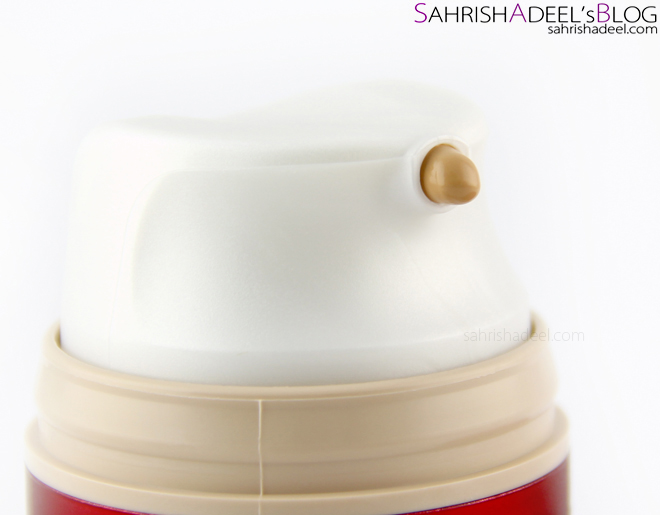 L'Oreal Paris Revitalift Total Repair 10 BB Cream - Review & Swatch | Sahrish Adeel - Malaysia based Pakistani Beauty & Lifestyle Blogger! Where I publish reviews about the products I love, I feel like I have to publish review about the product that did not work for me. 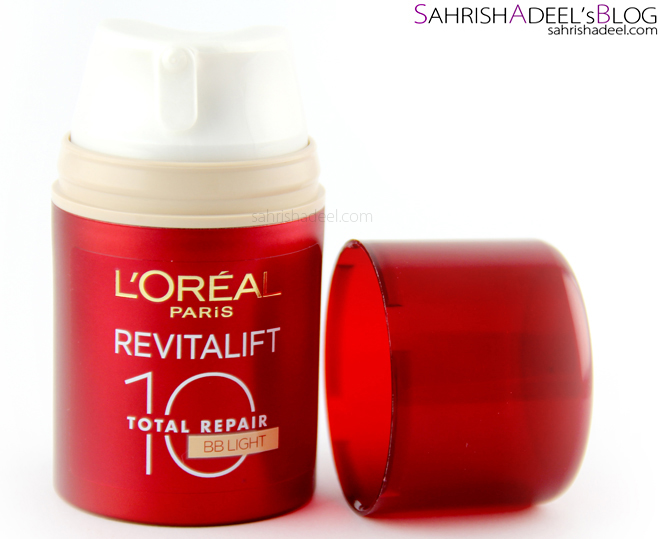 L'Oreal Paris' Revitalift Total Repair 10 BB Cream might not work for you just like it couldn't for me. Read the full post to know why it failed. The BB Cream comes in a plastic bottle with a pump. The product itself has creamy texture and a medicated scent. Each bottle contains 50 ml of product. This specific product from the range mentions BB Light on the bottle which (as far as I understood) means that it is a light wear formula as the shade itself was pretty dark. This anti-aging formula is designed for people aging 30-40 years (nah I am still not in that range). On left side of the photo, you can see the texture of the product and on right side, you can see the blended finish. The blended side is dried and was given 2-3 minutes before I took a shot but it still looks shiny / greasy. Yes, I will be talking about it later on. There are some products you love and some, you just hate but then there are some products with which you have a love-hate relationship; well this comes in that category. 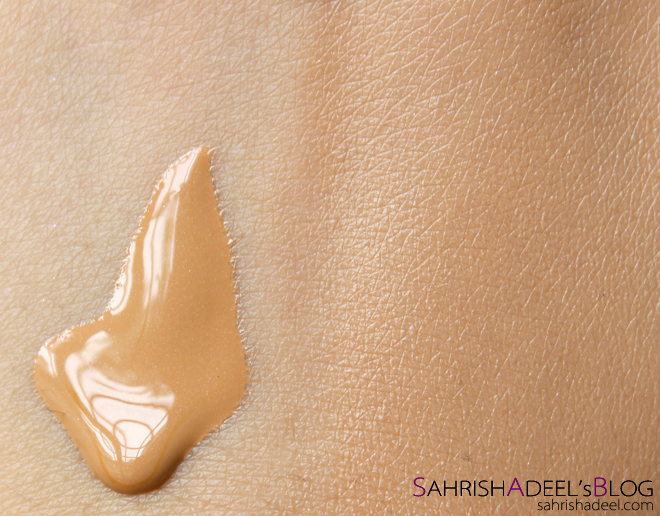 The formula blends super easily and covers each and every imperfection. I don't even have to conceal my dark circles. The shade was like two tones darker for me but at times I like to go a bit tanned. The product gives a medium coverage for one layer. I tried to build it up but for some reason, it took off the first layer and formed some disgusting looking residue. I felt like I had something on my skin beforehand and it just came off. I gave it a few more tries; applied it with fingers, sponge and with brush - gave it enough time to set and even applied second layer without letting the first one set. In a nut shell, I tried everything but the product still came off looking like a brown residue. (it might not make sense but imagine you have a powdery paste applied on your face and then you just rub it when it is almost dry, what would you get?) I even noticed that if I blend the product too much for first layer, the product still comes off. Now come to the finish, it surely gives a flawless and non cakey finish but it looks oily and greasy on face. I have tried using it on bare face, over my moisturizer and even over a face primer but it will stay sticky, oily and greasy no matter what. I also tried to set it with a powder but the sticky-ness comes up in merely 15 minutes. I know I have oily skin but this product does not say that it is not meant for oily skin types. I also asked my mother to try this BB Cream since she has a dry to normal skin type and has a bit darker skin tone than mine. She used it a couple of times and her final verdict was that it stays sticky and forms that residue unless I apply a tiny bit of quantity with fingers which doesn't even cover up much. - If this product didn't work for me after several attempts, I might be able to save some peep's money. - I wanted to know if more people have tried it and it worked for them, so please feel free to leave your comments. Overall, I wanted to love this product but it just had to go to the trash can, sigh! If you are looking for a really awesome Anti Aging BB Cream; Artdeco's Anti Aging BB Cream might be your dream product. 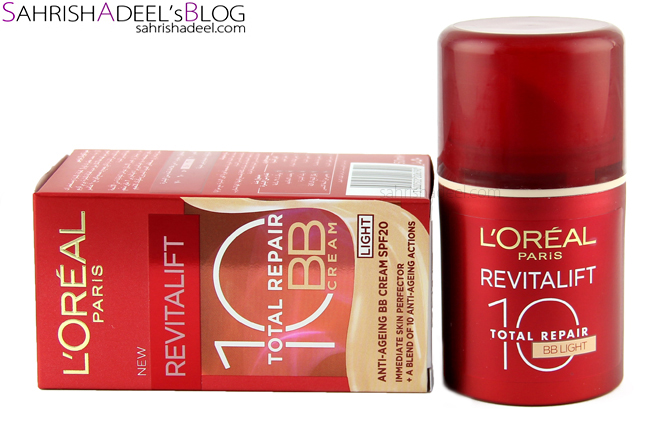 L'Oreal Paris Revitalift Total Repair 10 BB Cream costs pkr 1500 and is available in Pakistan and also worldwide where you can find L'Oreal's range. For more details, you can join L'Oreal Pakistan's Facebook page. Have you ever had a love-hate relationship with a product? Do share your experience with me.